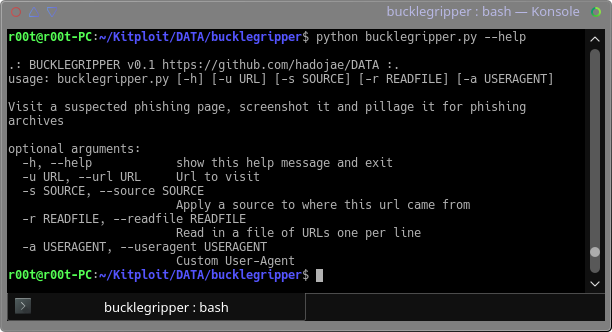 Given a suspected phishing url or file of line separated urls, visit, screenshot, and scrape for interesting files.
.: BUCKLEGRIPPER v0.1 https://github.com/hadojae/DATA/ :. While capturing a pcap visit a suspected phishing page. Handle redirectors and obfuscation to find a web form. Scrape the form and make educated guesses at what should be entered into the fields. Submit the form and repeat.
.: BULLYBLINDER v0.1 https://github.com/hadojae/DATA/ :. [-] No form found, checking for redirectors and obfuscation. [+] https://drive.google.com/#my-drive appears to be a legitimate website. A basic bash script that pulls urls out of pdfs in streams or in clear view. The only argument to the script is the path to a folder containing the pdfs you want to process. DATA scripts are a constant work in progress. Feedback, issues, and additions are welcomed. Proper python packages will be created once suffecient testing and features have been added and more bugs have been squashed. Be sure to disable NIC features when capturing traffic run this as root. Checksum errors will cause all sorts of nightmares.